All the indicator parts are in the Model A section. Click here for Vintage Ford Indicators! All the 6v, 12v and LED bulbs are in the Model A section. Click here for Bulb Section! 1948-50 Ford F1-F3 pickup parking lamp assembly, complete with polished stainless rim. Parking light socket wire repair kit. 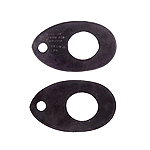 Tail Lamp rubber pad for the 1938-39 Ford V8 Car. Stainless tail light rim for the 1938-39 Ford V8. Teardrop style rear lamp for the 1938-39 Ford V8. 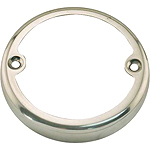 Stainless rim, fits left or right side. Red lens with 12v bulb fitted. Teardrop style LED rear lamp for the 1938-39 Ford V8. 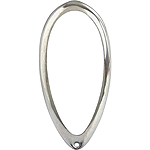 Stainless rim, fits left or right side. Red 12v LED lens. Pre-focus style 12v headlamp bulb for the 1935 - 1939 American Ford V8. Two bulb headlight reflector 7 3/4" OD. for the 1935-39 American Ford V8. Two bulb headlight reflector 9 1/4" OD. for the 1932 American Ford V8. American Ford V8 passenger car. Fits into the top of the headlamp bowl. This kit will let you convert your regular 12V headlights into quartz headlights. Simply enlarge the hole in the center of the reflector, and install this kit. Gives much better lighting for night driving. This kit will let you convert your regular 6V headlights into quartz headlights. 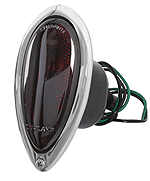 Guide 682-C style headlamps, 12v halogen, finished with a gloss black shell and chrome rim. 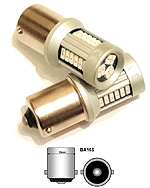 The guide light has clear lens which lights up amber with 5 LED'S. 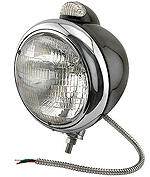 These are a recreation of the sought-after Guide 682-C lamps, perfect for traditional Hot Rods. 7" diameter sealed beam unit fitted. Set of two. 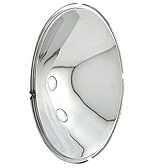 Guide 682-C style headlamps, 12v halogen, finished with a polished stainless steel shell and chrome rim. The guide light has clear lens which lights up amber with 5 LED'S. 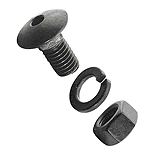 Headlight mounting bolt for the 1933-34 American Ford. 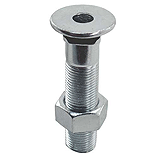 This is a special hollow bolt, to accept the headlight wiring. model A Ford and Ford V8 pickup. Right tail lamp bracket for the 1938-56 Ford pickup truck. Left tail lamp bracket for the 1938-56 Ford pickup truck. Tail Light lens for the American 1940 Ford. 1932 Ford Deluxe Tail Lamp. Right side (no number plate light). Beautiful reproduction Made in the USA with 'Duolamp' on the lamp and the lens. 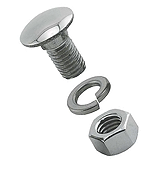 Highly polished Stainless Steel housing and rim, cloth braided wires, and stainless screws. 1932 Deluxe Tail Lamp. Left side. This left hand version includes the licence plate lamp. Tail Lamp Lens for the 1932 Ford and 1932-42 Ford Pickup. 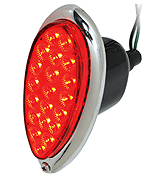 Right tail lamp, for all 1932 - 42 commercials, has black housing with stainless steel rim, red glass lens. 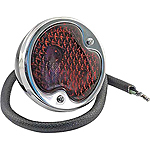 Left tail lamp, for all 1932 - 42 commercials, has black housing with stainless steel rim, red glass lens. This one also has the clear number plate lens. Twin filament tail light socket for a stagered pin bulb. Standard fitment on the 1933-48 Ford V8, but can be used to convert a tail light to use a twin filament bulb. Twin filament socket wire as fitted to the 1933-48 Ford V8 tail light socket. Can also be used to convert a tail light to use a twin filament bulb, if you add the 40-13410-SO socket. 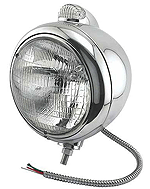 These are the ideal lamps for your 32 Ford highboy. Rear license bracket 1928-56. This bracket is a reproduction but 100% original. Even Henry Ford couldn't tell the difference. Powder coated black. Made in USA. Front License Bracket for the 1933-36 American Ford V8. Front License Bracket for the 1932 American Ford V8. Light switch bail for the 1928-34 Fords. This holds the light switch on the bottom of the steering column. Made in USA. 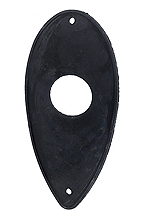 This is the new high quality USA made Light Switch Body for the 1928-39 Ford model A and V8. Mounts on bottom of steering column. The light wire harness slips inside this unit to turn lights off and on. Correct shaped/spaced contacts with a cad plated body. Pads, Headlamp Bar To Fender pad set, for the 1932 car and 1932-34 pickup. Headlamp Stand Pad Set for the 1936 Ford. Set of 2. Front sidelight lens for the 1951-52 Ford pickup F1 - F3. 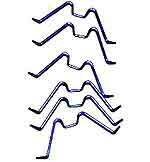 Set of lens retaining clips for the 1933-34 Ford headlamps. 1933-34 Ford V8 Model 40. Two required. 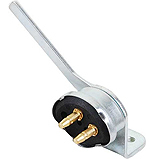 This one does not have the hole for the horn wire, so they are normally used with the short headlamp stands. 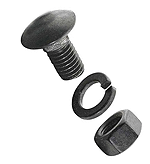 This one has the hole through the centre of the bolt, for the standard 1933-34 Ford horn wire. These lower the position of the headlamps, so you will not be able to use the standard horn mounting.